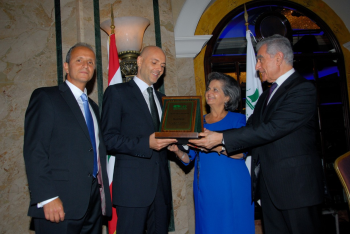 On Wednesday July 13, 2011, the Alumni Relations Office organized its annual dinner at Phoenicia InterContinental Hotel with around 350 alumni and friends in attendance. The Alumni Relations Office presented two alumni awards, the Alumni Recognition Award & the Alumni Achievement Award. The Alumni Recognition Award was granted to an exceptional alumni figure for her outstanding contribution and support to the Community and to LAU namely Mrs. Rima Daniel Hourani. The Alumni Achievement Award was granted to yet another exceptional alumni figure for his significant accomplishments in his professional life, namely Mr. Ricardo Karam.